Recently, Halifax’s Spring Garden Library was host to a discussion about Pink Triangle Day. The talk, which was presented by Robin Metcalfe and organized by NSRAP, took place on Tuesday, Feb 12. 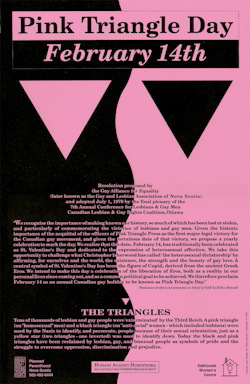 Metcalfe was instrumental in the recognition of this day, and his talk presented not only the history of Pink Triangle Day — and its Haligonian connection — but also about the history of the use of the symbol. For those of you who were unable to attend the talk, local queer website Gay Halifax recently posted Metcalfe’s talk on their website. You can listen to it here.